Make sure to go over to The New York Times site and listen to the audio interviews with these kids. Hear them talk about being extorted by Agriprocessors, forced to work long overtime hours without overtime pay and breaks, told that, if they complained, Agriprocessors would turn them over to Immigration police. This is slavery, pure and simple. Now ask yourself: Was your glatt kosher rib steak or Shabbos chicken worth this? Also remember Rubashkin’s rabbis were there on site, “inspecting,” through all of this. In some cases, it was those very rabbis apparently committing crimes. Think about that the next time you see an OU, Supreme Kosher, Crown Heights Beis Din, KAJ, UMK, or other Rubashkin-related hechsher on a product. Then buy something else. Gitty and Esther Miriam eating a meal—tuna salad and toast—at Gitty’s mother’s house. (c) 2007 The Star-Ledger. All rights reserved. A rabbi has filed a civil rights lawsuit against Freehold Township, saying local officials are conducting an illegal surveillance of his house and restricting his right to pray at his home. The federal lawsuit was filed yesterday in Trenton on behalf of Avraham Bernstein, who is represented by the Rutherford Institute, a Charlottesville, Va.-based civil liberties group that focuses on First Amendment and religious freedom cases. At issue is whether Bernstein, a rabbi with the ultra-orthodox Lubavitch Chabad, is allowed to host a minyan, the necessary 10 men to pray under orthodox Jewish law, at his home on Shabbat, Friday night to Saturday night. The Monmouth County township says Bernstein, who lives in town, is violating local zoning ordinances because he is using his home as a house of worship, according to the lawsuit. FREEHOLD TOWNSHIP, NJ — Seven members of the township Zoning Board of Adjustment unanimously decided Thursday that a local rabbi is, in fact, running a house of worship out of his home. Nero was referring to 351 Stillwells Corner Road, the home of Rabbi Avraham Bernstein. Bernstein’s neighbors have long complained that Bernstein is running religious services out of his home, which is located across the street from the township Municipal Complex. The township does permit houses of worship in residential areas, but requires a use variance for their operation. 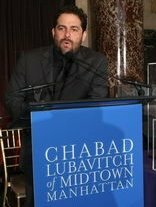 Bernstein — a member of the Jewish organization Chabad Lubavitch — does not have a use variance to run services out of his home. After years of mounting frustration among his neighbors, one — Paul Sweda, who lives next to Bernstein — asked the zoning board to determine whether Bernstein is operating a house of worship in violation of the township’s zoning ordinances. The board began hearing the case in January. During the hearing process, the board heard from several witnesses who described watching people visit Bernstein’s home on Fridays and Saturdays, and observing what they believed to be religious celebrations at the house. Based on that testimony and their own observations, board members said they felt assured that Bernstein’s home met the definition of a house of worship. To be a house of worship, a property must be used for traditional services, meetings or gatherings of an organized religious body or community, which are presided over by an ordained or “otherwise officially recognized” leader of the body or community. “I have heard sufficient evidence to indicate indeed this (house) is being used as a religious site,” said board Chairman Edward McCloskey. The board chose to vote on the matter Thursday night despite written protests received from Bernstein’s new attorney, Vincent Manning of Freehold, said the zoning board’s attorney, Dennis Galvin. Manning replaced Red Bank attorney Gerald Marks. After the vote, Sweda said he was pleased with the vote but did not want to comment at length. “They (the board members) said it well,” Sweda said. It was not clear what the next step would be for Bernstein, and he did not attend the hearing. Bernstein still has remaining legal issues with the township, which he has sued in both federal and state courts. In both suits, he alleges — in part — that his constitutional rights to worship freely have been violated by the township. On Saturday evening July 19, i watched CBS news with Forrest Sawyer. He did a piece on Agriprocessors in Postville, Iowa. It had a obvious slant. Yes it is very sad that 700 people lost their jobs. Three hundred ran away and 400 were arrested. It did a short interview with one of the owners who instead of wearing his yamulke he was wearing a baseball cap and a trimmed beard. Now come on CBS these are Lubavitch Orthodox Jews and usually do not wear baseball caps. No where in the piece did it mention that these people are Orthodox Jews producing kosher meat for Jews. They mentioned kosher once. And where did these owners think 700 Guatemalans come from when they came to Postville years ago and bought an almost closed and out of business meat processing company. The citizens of Postville tried to work for these people but they were paid so bably and treated like dirt that all the Iowans left. 700 hispanic people just materialized out of thin air and they did not know. Another example of the liittle guy taking all the blame and two managers being the scape goat for these egregious owners, smart clever lubavitch butchers from Brooklyn…..they are guilty and should pay but will walk away with their millions. And shame on CBS news for putting on a puff piece. A crisis PR person got to the network. At least the newspaper articles have told more of the facts. No wonder TV news is dying. RATNER AND HIS SILVER CUP – FOR SERVICES RENDERED? 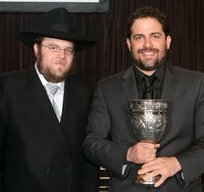 Top Hollywood director, 39-year-old Brett Ratner is a Chabad-Lubavitch asset and former Talmud (yeshiva) student. The extremist Chabad follow the teachings of their dead messiah, Schneerson, as well as Shneur Zalman of Lyady, who taught in his “Tanya” that all gentiles are soulless trash. Chabad also teaches that Arabs are “Amalek” (deserving of extermination) and that Jesus Christ was a sorcerer and Christianity is idol worship. Postville Iowa Lubavitch problem started a long time ago. Read Jon Tevlin’s excellent in-depth article, There’s something bad in this town. Rabbi Allen of Beth Jacob Congregation knew about Agriprocessors’ problems a long time before the raid. He knew the most recent CEO, Sholom Rubashkin, who for a time lived in St. Paul’s Highland Park before moving to Postville. After reading an article critical of the company, Allen led a delegation of Twin Cities rabbis to Postville in 2006. Workers told story after story of long hours, unsafe conditions and wages as low as $5 an hour. They told him many of the same things now in court documents. “They appeared to me to do everything possible to maximize the bottom line at the expense of human dignity,” Allen said of the plant owners. The Minnesota rabbis tried to work with the Rubashkins. “I think if they had followed our advice, this may never have happened,” he said. Allen is now leading a national movement to create a certification program called Hekhsher Tzedek, much like fair trade agreements, which would ensure not only that kosher meat is prepared properly, but also that workers are treated fairly. Jews in the Midwest weren’t blindsided by this scandal, and tried to get the Lubavitchers to obey the law. It was never a secret what the Rubashkins were up to. From day one word got out all over northern Iowa about the bigoted Jews who’d moved to Postville. Initially, this transplanted community rejected all welcoming efforts and determinedly kept to themselves, refusing to even engage in small talk with locals. And the locals, understandably, took deep offense. So much so that Agriprocessors launched a PR effort to improve community relations (without having to mingle with the locals anymore than was absolutely necessary). But what I don’t understand is why the locals turned a blind eye to the Guatemalans. Only an idiot would think that our government had granted work visas to that many Central Americans. This is one of the last chapters in a long and sordid story about Iowa labor. When I was active in that movement in the ’70s, meatpacking unions across the state were under constant fire. It’s a vicious industry, and men who own plants that profit from selling meat, blood and guts aren’t squeamish about breaking unions. But the men who worked in packing plants were hard cases as well, and most of the packers ended up shutting down their plants rather than continue to pay union wages (living wages earned through demanding physical labor). This was but a part of the great labor realignment Reagan brought with him. In Reagan’s first term, Iowa lost over ten percent of their work force. Tens and tens of thousands of Iowans were forced to leave the state to find employment. Came the ’80s and Terry Branstead became governor. Branstead opened the doors to Iowa Beef Packers, and they swooped into Iowa with a vengeance, buying up old packing plants for pennies on the dollar and then bringing in Mexican laborers because even out-of-work Iowans wouldn’t do packing house work for the low wages offered by IBP. It got so bad that state Attorney General Tom Miller sent letters out to every conceivable Hispanic organization warning them that IBP’s wages and working conditions did not offer decent job opportunities. The fact was that the Mexican workers ended up living in crowded apartments because they didn’t make enough money to pay rent. Despite having dangerous jobs, they had no health insurance, and IBP quickly developed a record of lying about workplace injuries. The workers were mostly men living apart from their families, locked into low wage jobs that didn’t permit them to bring their families to Iowa. Agriprocessors simply moved into an existing bad situation, then proceeded to make it worse. Read Tevlin’s article. It is only because of the lawless nature of the Bush administration that Agriprocessors’ owners are not facing trial. And God help them if they ever are put on trial. Kosher meat is a monopoly, and Agriprocessors could have raised their prices at any time, allowing them to easily pay living wages to legal employees. They chose not to. They chose to break labor laws, they chose to dehumanize their workers, they chose to reject the embrace of the local community and to instead develop an insular community. It’s that last bit that’s the most telling. The Lubavitchers moved from Brooklyn to rural Iowa, and then sealed themselves off so their children wouldn’t be contaminated by the locals. To them, there was no difference between the gangs of Brooklyn and the church softball leagues of northeastern Iowa. They could have paid high wages without significantly impacting their sales (it’s good to have a monopoly on a product that’s endorsed by your religion). I think the Jewish community need to recognize that within their faith, they harbor bigots every bit as vile as the worst Aryan Nation villains. And no, I don’t think I’m telling them anything new. I’m just encouraging Jews to be more open in their rejection of extremist beliefs. Postville was never in danger of becoming the Jewish Waco, but that doesn’t mean there isn’t a strong element of Branch Davidian nuttiness permeating the Lubavitcher movement, a religious sect as fucked up as anything Sun Myung Moon or Jim Jones ever concocted. Seriously, on a theological level, the Mormon faith makes more sense than the bastardized Judaism practiced by Lubatvitchers, a personality-centered cult that should have disbanded when Rebbe Schneerson died. Chabad Hasidim believe that there is no successor to Schneerson and all the suggested successors declined the mantle of leadership in the days after his death. Chabad Hasidim believe that he is still their leader, guiding them from beyond the grave through prayer and signs. Some Chabad Hasidim believe that he will return as the Messiah; this view has led to controversy with other Orthodox groups and within Chabad itself. Some, quoting Talmudic passages and statements that Schneerson himself made, refuse to put the typical honorifics that Jews normally use for the dead after his name. Schneerson’s messianism or divinity is not advocated in any of Chabad’s official literature, but such literature is published and distributed by people who hold that belief. Chabad-Lubavitch leaders have repeatedly condemned the Meshichists (messianists) in the strongest possible terms. Kudos to the Twin Cities Jewish community for recognizing the problems being created by these transplanted Lubavitchers early on, and for trying to help fix a situation that predictably blew up in everyone’s faces. The Santa Monica Mountains Conservancy board will vote on Monday night whether to allow the Palisades Jewish Early Childhood Center to continue operating its program in Temescal Gateway Park until the end of January. Despite the language, Chabad Rabbi Zushe Cunin asked for a lease extension at the beginning of June. Conservancy Executive Director Joe Edmiston denied the request, but Cunin has subsequently appealed Edmiston’s decision to the Conservancy board. The board has the power to make the final determination at its 7:30 p.m. emergency meeting on Monday in Stewart Hall at Temescal Gateway Park, 15601 Sunset Blvd. The public is invited. Cunin told the Palisadian-Post that he has asked for an extension because it is taking longer to secure the proper permits to relocate the school to a storage building off Los Liones Drive at the base of Castellammare resident Gene Gladden’s property. Cunin signed a three-year lease agreement with Gladden, but the 28-year-old storage building is not easy to access. The building sits on a hillside behind the Mormon Church’s gated parking lot and along the Getty Villa’s service road. Gladden’s driveway is shared with other neighbors and located off a narrow road. The Mormon Church and the Getty have denied the Chabad access, and the Castellammare neighbors have argued that Gladden’s driveway is not appropriate. Cunin has agreed he would not use the driveway. Cunin and his attorney Benjamin Reznik, a partner at Jeffer, Mangels, Butler and Marmaro, examined city-planning files and discovered a reference to a dedicated public easement off Los Liones. According to Reznik, the road is located on part of the Getty’s service road and a portion of the Mormon Church’s property. Reznik said he is currently pursuing plans to use the public easement to access the building and will soon apply for a conditional-use permit (CUP) to operate a school in a residential zone. ‘The current CUP process is taking longer than we expected,’ Cunin said. The Chabad has found other facilities that could temporarily house the preschool, but would prefer to stay in Temescal Gateway Park, Cunin said. As customary over the last few years, the preschool has packed its belongings into storage for the summer and is operating a summer program at Palisades Elementary. Cunin has sought help regarding the Temescal lease agreement from Governor Arnold Schwarzenegger’s office. On June 26, California Secretary for Resources Mike Chrisman sent a letter to Cunin on behalf of a request from Schwarzenegger. According to the letter, obtained through the Public Records Act, Chrisman provided Cunin ‘with what I hope are helpful guidelines for proceeding with the SMMC board.’ Chrisman attached guidelines that explain the application process. Chrisman also drew up a document for Cunin to sign. The document indicates that if the Conservancy board extends the lease, the Chabad will abide by certain stipulations, such as paying rent for the entire term of the extension and complying with the terms of the previous lease agreement. Cooney said the letter was sent because Cunin asked for assistance, and the agency tries to help groups whenever possible. The Conservancy is under the California Resources Agency’s umbrella, but is an independent organization with complete autonomy to authorize or deny the lease extension, Cooney said. While the Resources Agency does not have the ability to approve an extension, one member of the seven-member Conservancy board is a representative from the agency. Cunin said he is grateful to Schwarzenegger’s staff. ‘The governor is a children’s advocate, and we do appreciate that they are trying to be helpful, so the children can have an easy transition into their next school,’ Cunin said. At that time, the Conservancy board decided to give the Chabad an extension because another preschool (Little Dolphins) was given until this summer to find a new location, Edmiston said. Little Dolphins’ lease expired last summer, but the agreement did not have a ‘no extension’ clause. The preschool asked to stay in the park another year in order to find a new location, and the board decided it would be unfair to ask the Chabad to leave earlier, Edmiston said. Little Dolphins moved at the end of June to a new facility in Santa Monica. The Conservancy plans to use the space once occupied by Little Dolphins and the Chabad for at-risk youth programs. Now, ‘it will be unfair to have told Little Dolphins to leave and allow the Chabad to stay,’ Edmiston said.